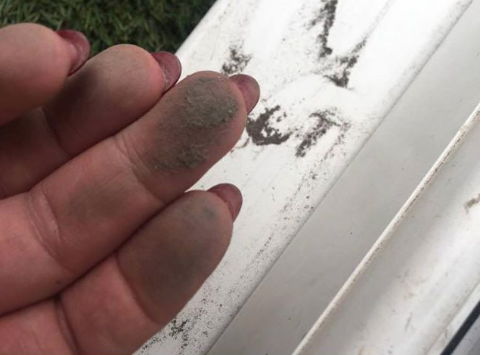 LOCAL health teams were told to say that the metallic dust that has blighted Tilbury for months is nothing more than a “nuisance” despite leading health authorities not knowing if the statement was accurate, internal emails have revealed. Thurrock’s Public Health teams were advised by a Public Health England consultant to tell Tilbury residents that the dark brown dust blanketing their homes and cars is “a nuisance but not believed to be a direct risk to health” in November last year. But a raft of emails obtained by the Local Democracy Reporting Service show that at the same time authorities including Public Health England, the Port Health Authority and Thurrock Council, were debating whether the statement was true. A follow-up email sent a month after the advice was given to the public health teams, Public Health England’s Environmental Hazards and Emergencies Department wrote that a “detailed assessment of the potential hazards associated with any exposure to the dust is difficult beyond general terms”. It continues: “This could for those exposed, exacerbate short term health effects such as nose, throat and eye irritation and the symptoms of anyone with pre-existing respiratory conditions, such as asthma. It goes on to say a sample will help gauge the size of the dust particles, which will indicate whether there is a danger associated with it. Small dust particles can be inhaled and result in short or long-term health effects, while larger particles can become trapped by the nose, throat or upper airways and are “unlikely to cause long term health effects”. A crucial piece of advice that was not communicated to residents despite it being advised in many of the emails is that if residents are concerned about their health they should “seek medical advice from their GP or NHS”. Public Health England’s mixed messages resulted in Councillor Aaron Watkins passing on advice that there is no health risk to the council and residents who had presented a petition. Ian Wake, director of Thurrock Council’s Public Health Team, also emailed before the follow-up email in December, calling for a “collective council response to the community” because “rumour and mis-information are likely to multiply if the community is left to its own devices”. In response to the email revelations the councillor responsible for the environment has stressed that testing must be done so that the a conclusion over the health implications can be put to rest. Councillor Aaron Watkins had faced accusations that he misled the public by telling the council in November that “tests were carried out by the environment agency” and those results show it “does not pose a direct risk to health”. His claims were rejected by the Environment Agency and Public Health England, with the Environment Agency claiming in February that it had not carried out any tests and Public Health England denying they had been involved. However, the emails show that the comments made by Mr Watkins were in line with the advice given by Public Health England at the time, despite them later admitting uncertainty over the claim. Mr Watkins said: “I had been clear in my statement based on the information I had received at the time. We have setup a steering group so that we can understand what tests the Environment Agency has done and to gauge an understanding of what advice Public Health England wants to pass on. “The council’s focus has continued to be on getting the tests done and we are still striving to get this done. “We are making progress and we are working with Environment Agency to work toward testing. “It is also not just about the testing, but about the Environment Agency having responsibility and following up and making sure plans are in place and correct procedures are in place with companies on the docks. Councillor John Allen, ward councillor for Tilbury St Chads, said: “There is not enough being done. I have called on the authorities to do tests and I understand no tests have been undertaken to determine whether it is harmful to the public’s health. “We don’t know whether it’s detrimental and I would call on the authorities to do the testing which I understand is quite expensive but needs to be done, then we can look into where it is coming from. 2 Responses to "Emails reveal residents advised Tilbury dust was safe, despite uncertainty from authorities"
Could a Lawyer take a multi Billion pound Class A action against any. authorities, The business that caused this. Could this not open the Councillors too loss of the homes personal assets, savings, investments. and a multi decade prison sentance? I fear the Councillors by there actions could lead to a needless field day for any lawyer.